Nanjing in China is a traditional pilgrimage centre. A new temple complex has recently been opened at the location. 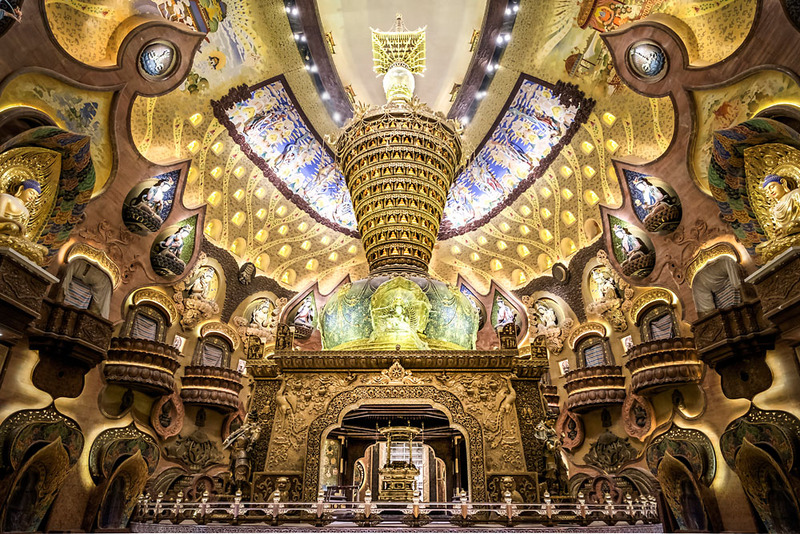 The central hall with a priceless relic of the Buddha Shakyamuni radiate in light from ERCO. 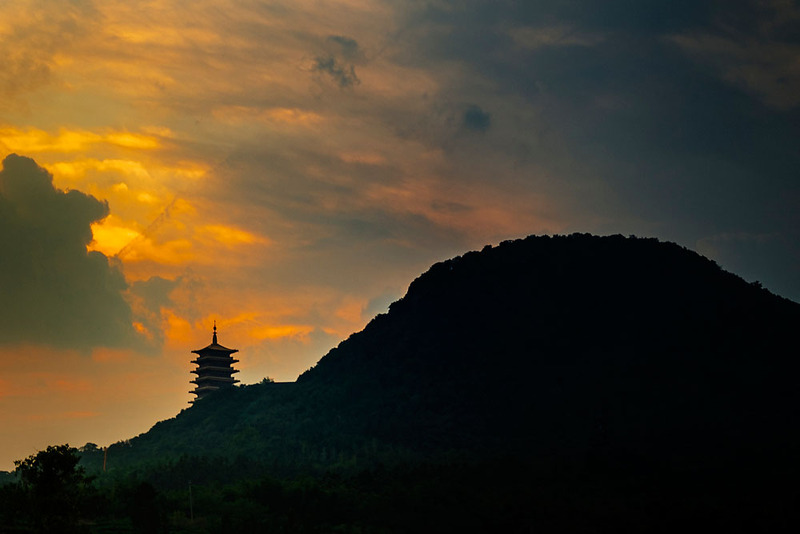 Legends saying that at one time Buddhas met together on the Niushou Mountain in Eastern China. Over the centuries many Buddhist buildings were constructed here, and recently a palace of superlatives even by Chinese standards. 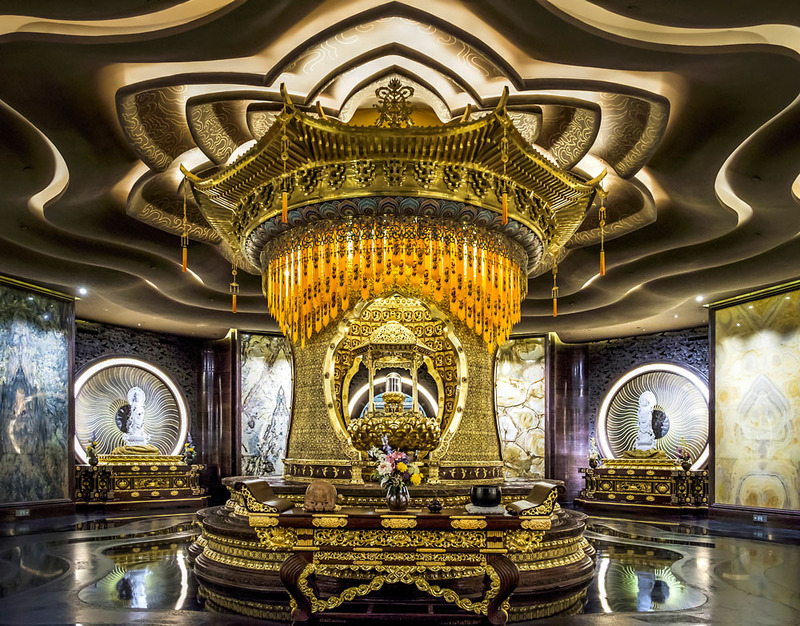 Its main attraction is a piece of skull bone that believers worship as a relic of Buddha Shakyamuni, and as a consequence the palace was named after the characteristic elevation on the back of the head of Buddhas that represents wisdom and is called “Usnisa” in Sanskrit. The Usnisa Palace with its two domes can be seen from afar. It has a length of approximately 220 metres, a width of 160 metres and is 90 metres high, with three storeys above ground and six storeys below. The Thousand Buddha Hall is situated in the centre of the complex with an elliptical base and a dome above achieving a height of 28 metres. A monumental memorial is situated in the centre, surrounded by Buddha representations. 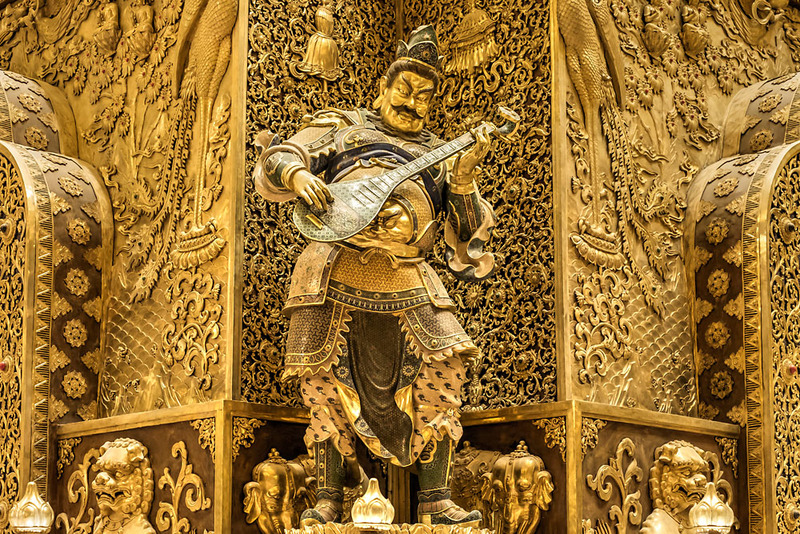 The complex ornamentation in strong yellow, red and gold tones is according to the design tradition of the famous Bao’en Temple, constructed in the 15th century in Nanjing during the Ming Dynasty. The Ten Thousand Buddha Corridor surrounds the Thousand Buddha Hall, and contains exhibitions focusing on the Indian and Chinese history of Buddhism and the life and relics of Buddha Shakyamuni. The Usnisa relic is located in its own room called the Usnisa Worshipping Palace. Here it lies within a memorial that due to its open structure enables the relic to be seen from outside. The Usnisa Palace is illuminated with ERCO LED lighting tools. Interior designers from Hyee Design HKG together with lighting designers from ATL Lighting design ensured that the light supports the meditative atmosphere of the space. 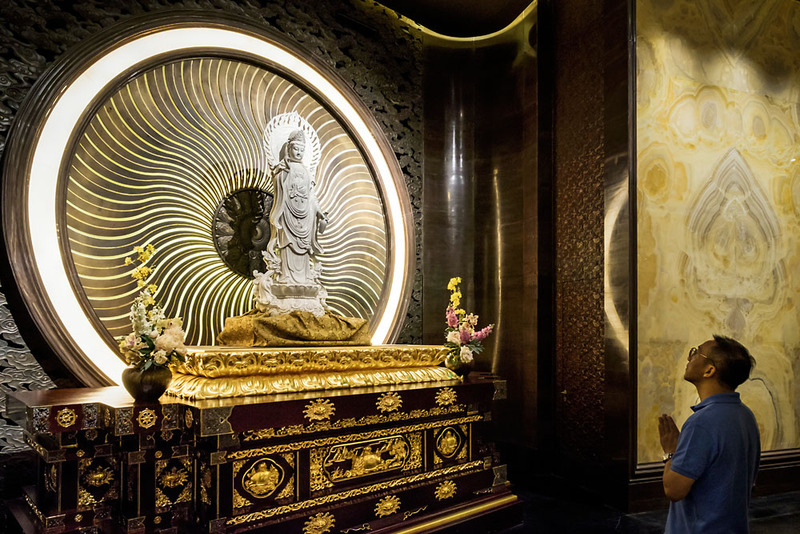 They specified warm white light with 3000K that brilliantly emphasises the warm colour tones of the artworks, while strong accents guide the attention of visitors to the Buddha representations. The light is aligned precisely onto the target planes to avoid glare for observers despite the glossy surfaces. The luminaires installed on the high ceilings not only provide high lumen output but are also controllable via DALI and largely free of maintenance. Furthermore, the light sources are as far as possible concealed from view and lend the impression that the space illuminates from within. Thanks to their compact and discreet design the luminaires are hardly noticed, placing a focus on the light impact itself. ERCO Parscan spotlights with 48W and 5040lm were mainly installed with spot, flood and wide flood light distributions. XS floor washlights and Nadir recessed floor luminaires from ERCO communicate a feeling of safety and security to visitors without detracting from the religious character of the representations. The relic is illuminated with Grasshopper projectors and the interior of the memorial with Beamer projectors from ERCO. To install the lighting tools to the base of the memorial and for reasons of space, outdoor luminaires were specified. Luminaire families can be ideally combined because of the same high LED quality used throughout all ERCO product ranges.